Old enough to remember the Mighty Sparrow’s 1983 “Capitalism Gone Mad”? What the heck went wrong with it these past few years? Capitalism, that is; not Sparrow’s song. It may be that capitalism is like a gun or a religion. It just fell into the hands of the wrong people. 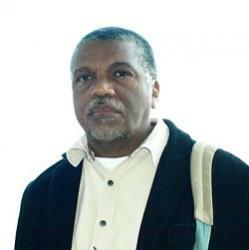 In the Caribbean, Jamaica had its Cash Plus ‘alternative investment’ scheme under Carlos Hill who offered ‘lenders’ such high returns on their ‘loans’ to his business, that when compounded they would soon own all the money in the world. Hill, who had served time in a New Jersey prison for a mortgage scheme fraud that had ties to questionable characters in Latin America, was arrested on allegations of fraud, at his home in a ritzy Kingston neighbourhood and is awaiting his day in court. His lenders, many who had something akin to deep religious faith in him, are awaiting word on whether there are any real assets in his globally diversified scheme from which to repay them. Then in February, Turks and Caicos Island police arrested David Smith, a Jamaican who had relocated his OLNT foreign exchange trading empire there after financial regulators in Kingston deemed his operations to be below the radar of legality. He was even more of a god to his investors who now congregate at virtual places to share grief, anecdotes and rumours about the business and its principals and when/whether they will get their money back. While the indictments of both financial artists speak of Ponzi schemes with latecomers paying the hefty margins to the earlier suckers, the main actors insist they are innocent and were involved in no shady business. It’s the bad minded established bankers who felt threatened that were leading the brigades against them, many supporters declared. Then news broke about Bernie Madoff, pronounced made-off in the USA, and our Caribbean suspects seems to pale in comparison in the scale, scope and brazenness of their schemes. You could say that in was in honour of the 60th anniversary of the death of the man who gave his name to the scheme that Madoff was sent off to Ponzi heaven for more than 100 years, when he pleaded guilty to swindling clients out of billions of dollars. Assistant U.S. Attorney Marc Litt calculated that $177 billion might be a restitution amount but defence attorney Ira Sorkin said that number is a gross exaggeration. Then there’s the American-Antiguan, Sir Allen Stanford, another major leaguer who is now being investigated by the FBI on allegations of defrauding investors through his global empire with head offices in Texas and branches from Antigua to Venezuela and 137 other places. Stanford discovered Antigua, a perfect fit, more than 20 years ago and settled in buying the Bank of Antigua and becoming part of the local hoity-toity before using cricket sponsorship to spread his wings across the English-speaking Caribbean as a major sponsor of a million dollar competition. After he was spurned by the cricketing governing body, because they thought his business was too shady for their liking – according to the grapevine – he moved the sponsorship to mother England from which he had gained a knighthood courtesy to former prime minister Lester Bird. Last week the FBI issued an appeal to investors in Stanford’s empire, including Bank of Antigua, to contact them to help in their probe into the potential fraud. “Have you invested in the Stanford Financial Group or its affiliated companies in recent years? If so, you may be a victim of a multi-billion dollar investment fraud,” said the FBI release. “The Stanford Financial Group, which provides wealth management services to customers in some 140 countries, is under FBI investigation. On February 26, its Chief Investment Officer was charged with obstructing a separate investigation by the U.S. Securities and Exchange Commission. The Bureau was interested in reaching persons who had invested in the Stanford Financial Group or its affiliated companies: Stanford Capital Management, the Stanford Group Company, the Stanford International Bank, the Stanford Trust Company, and the Bank of Antigua. 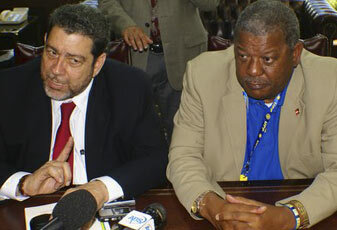 Prime ministers Ralph Gonzalves and Baldwin Spencer, explaining their confidence in the Eastern Caribbean Amalgamated Bank. When the Stanford fraud case surfaced there was a run for a few days on the Bank of Antigua. In the face of assurances by the Eastern Caribbean Central Bank, the regulator (for Antigua and Barbuda, Dominica, Grenada, Montserrat, St Kitts and Nevis, St Lucia and St Vincent and the Grenadines), and the government of Antigua and Barbuda, five of the members of the currency authority came together to form a take over company, Eastern Caribbean Amalgamated Bank (ECAB). In the attempt to salvage confidence, last weekend (March 7) Antigua and Barbuda’s prime minister, Baldwin Spencer and his St Vincent and the Grenadines counterpart, Dr Ralph Gonsalves, in a show of support for the bank, deposited 20,000 EC each in ECAB – Gonsalves into a new account while Spencer reactivated an account he had. The Antigua and Barbuda government announced that it will divest its 25 percent share in the bank to the public. An FBI investigator in response to queries from Abeng News said she could not comment on the situation. ” We are aware of the takeover. However, it should not impact our investigation. We would not be in a position to comment on how it would affect clients,” she said. Today’s collapse of the global financial system that is killing the real economy revolves around a confidence game. Here there is an intended double entendre: The general public and rational investors have lost confidence in a system that has let them down and they have seen how low supposedly decent people can get having won their trust and support. The stock markets, the money markets and the commodities markets were all based on and will continue to be big gambles on creating wealth – often based on nothing but speculation and fear mongering. It is the nature of the modern economy, ever since the Chinese invented paper money so that, as with language, an idea could stand for a real thing. The compounding of the abstraction has led to a mysticism in which the idea has become the thing and is worshiped above reality. Little wonder that powerful men in high places who themselves authorized a system that created the mayhem now vilify those who attempt to put people at the centre of the equation. To counter the madness that has been let loose, it seems US president, Barack Obama, has had to countenance Ben S. Bernanke abandoning the long tradition of Federal Reserve chairs not giving media interviews. Bernanke, on 60 Minutes in a first ever Fed chairman interview Sunday night, sought at the end to wave the magic wand of confidence, the light at the end of the recession tunnel, just like our Gonsalves and Spencer are telling us capitalism has not gone mad – again.